You are here: Home / Book Activities for Kids / Monsters Theme Learn and Play Day: Printables, Puppets, and More! 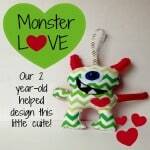 Monsters Theme Learn and Play Day: Printables, Puppets, and More! We LOVE themed learning and this monster theme learn and play was SO much fun! Printables, food, games, crafts, books, and more – pick your child’s favorite activities and start the learning fun. Maybe you could tell by the title, but we are using monsters to help teach our 2-year-old about diversity, emotional intelligence and of course, courage and bravery. 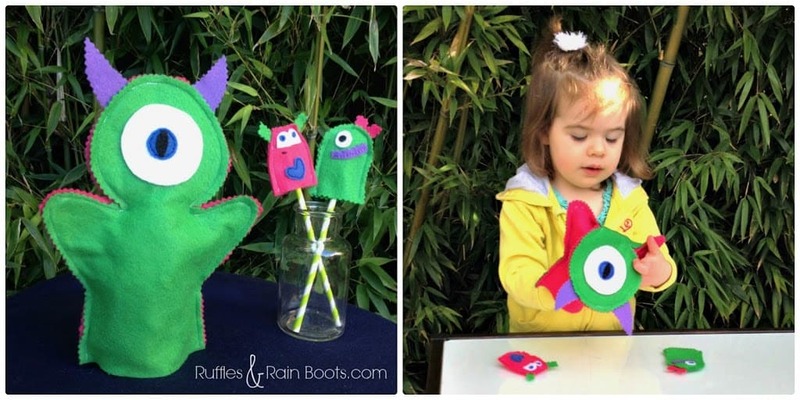 We had a great “Monster Theme Learn and Play Day” here today and I am sharing some games, craft ideas, easy DIY puppets and monster food. This would make for a great play date or the start to a monster themed birthday party. 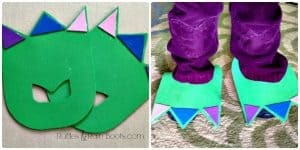 I put together these little monster feet using this template from Make and Takes (I did have to alter it for her little feet to make it smaller). She put one of the monster feet on and I asked her to compare it to her ‘people’ feet, as she said. This was really just a fun little activity to get her into the monster mood, so to speak. It worked wonderfully! More importantly, we talked about how appearances can make something scary but that really, underneath, it’s something familiar. I used craft foam and they held up. They are still going strong and have even survived a trip to the grocery store. She wore them nearly all day and had a lot of fun stomping around singing, “stomping in my monster feet” over and over. by Mike Austin (partner link). 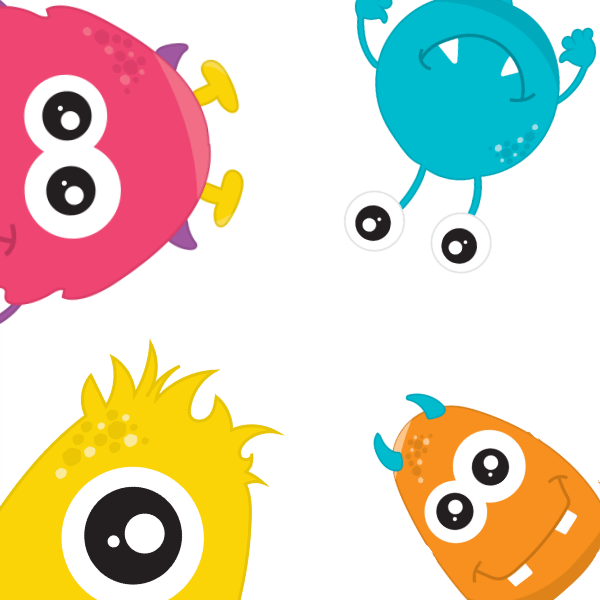 Each of the simply drawn, toddler and preschool age-appropriate monsters describes their favorite primary color and they all work together to make sure other monsters get their favorite color through color mixing. Other than the color mixing, it is a book with a few other themes: helping others, working as a team, taking turns and diversity. To accompany this book, I drew out two identical monsters on a large piece of activity paper. I folded it in half and asked Elise what features the monster had and asked her to color it. Then, I flipped over the paper and asked her to describe what features she saw on this monster. 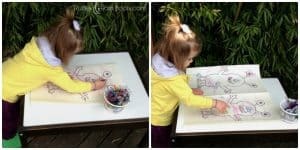 She then colored the second monster. When finished, I opened up the paper and she talked about how they looked the same, but how the colors she used made them different. by David Milgrim (partner link). 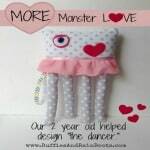 We’ve enjoyed it already and it inspired the two plush monsters I created for Elise. If you’d like to read about them, click on their pictures below. Elise is very emotive nowadays. She’s 2-years-old, so I guess that’s a given, right? The research I’ve done shows that although they are having feelings like surprised, sorry, and frustrated, toddlers do not understand how to communicate their emotions. Jeff and I thought this kind of exercise could help her learn to identify and verbalize her emotions. During one of my Pinterest time-wasting sessions, I stumbled across this free printable of emotion cards from Professor Poppins. They are simple enough that Elise can decipher between them and fun enough that she didn’t bore of them quickly. Below she is acting out her favorite card: surprised! I also whipped up some felt puppets to reinforce our learning with some role play. It’s very easy for kids to associate certain “bad” emotions with puppets instead of themselves. I didn’t use a template for the hand puppet but found this one for you in case you’d like to check out how easily they take shape. Teaching children courage, bravery and how to overcome fear is easy using monsters. It just makes sense. Own your fears. Obviously, this is a bit of an advanced concept to work into a 2 year old2-year-old’s she learned the word “scared” somewhere and has been using it. We want to make sure she knows there are alternatives to being scared and feeling powerless. This monster wreath was super easy to put together and was a very quick craft. Each Halloween, this is hanging on one of the doors! by Maurice Sendak. Discussions were brief, but centered around Max’s desire for adventure and his courage with the wild things. 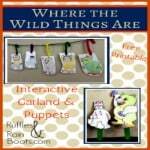 We used these Where the Wild Things Are puppets to act out some scenes and solidify the concept. You can read more about some fun we had with this classic story, and find your own free printable for the puppets there. Monster Food, Songs, Crafts, and More Monster Fun! 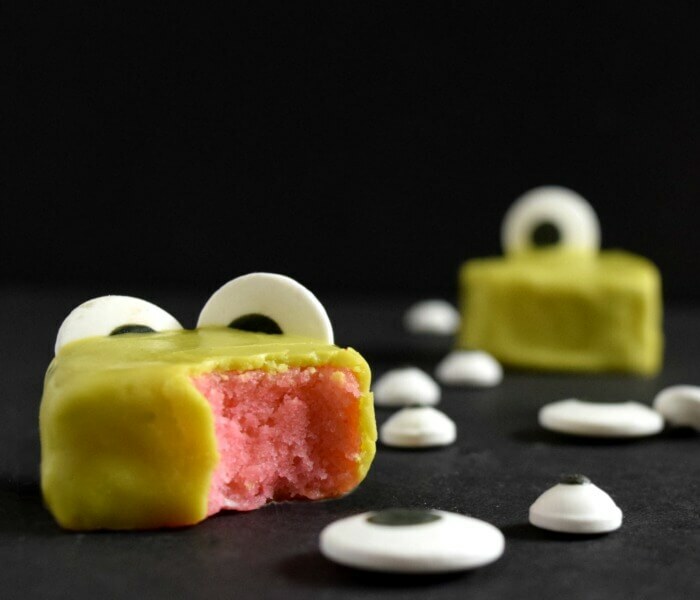 These ridiculously easy mini monster cakes were so much fun. We will definitely make them again! Wow, this was such a bit hit! It took a minute to put together but was the talk of the neighborhood. 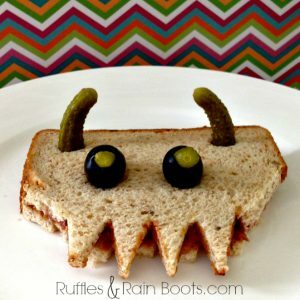 I used black olives for the eyes and pickles for horns. I suggested carrot sticks for the hair but was vetoed. I cannot tell you how much Elise enjoyed helping to make her monster sandwich. When Jeff asked about her day, it was the first thing she mentioned. We also used the monster theme learn and play session to have more fun! 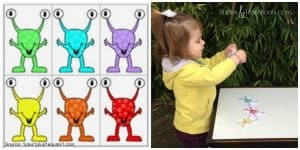 We played match using the Happy Monster cards, a free printable from 1 plus 1 plus 1 equals 1. Elise really enjoyed this and even suggested we make a rainbow monster garland! I’ll end this bit of fun with a song we sang today – a take on “Five Little Monkeys.” You can find this, and so many other great songs, at Preschool Education.com. 5 little monsters, sleeping in my bed. 1 crawled out from under my spread. I called to Mama and Mama said. No little monsters sleeping in my bed. None crawling out from under my spread. I know this was a big day and you don’t have to do all of it, but it was such a great way for us to tackle some “big” issues. I can’t wait to set up our next monster theme learn and play session. I love everything about this!! hat a great way to talk about some of those “big issues” as you say. I love the diversity story, things that are unfamiliar are often scary. What a wonderful lesson to teach. This is perfect for my son. Love it! How fun! 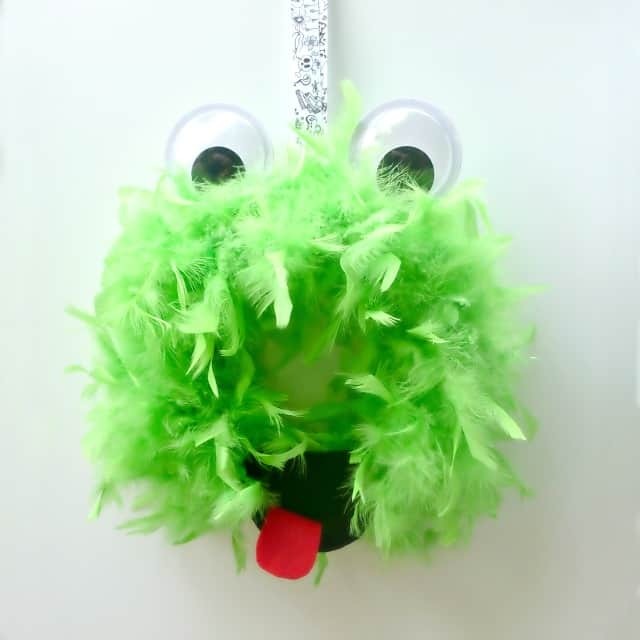 I’m totally inspired to get some monster-themed activities going on my classroom. I never thought to use the theme to also teach diversity, but it’s just perfect because no two monsters are alike! I often have at least one student who, for religious beliefs, doesn’t celebrate Halloween or birthdays… But I might sneak something in this year for Halloween, calling it a “monsters are unique and so am I” activity. Thanks for sharing! Nikki invites you to read Thank You For Your Support! We still read Monsters are Different around here, Nikki. Our daughter seems to really like the idea of identifying differences and similarities, and she’s even begun noting them with her friends.